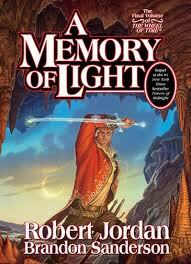 A Memory of Light is the final novel of the #1 bestselling Wheel of Time series. Fantasy doesn’t have the greatest reputation among literary writers–despite the efforts of crossover authors like Neil Gaiman, China Mieville, and Ursula K. Le Guin. While it’s true that fantasy novels—and many novels of all genres, including literary—often contain cringe-worthy sentences, that doesn’t mean they’re not well written. Case in point: The Wheel of Time series by Robert Jordan (completed by Brandon Sanderson). The fourteenth and final installment of the series, A Memory of Light, was released in January and spent weeks atop the bestseller lists. Certainly, the series boasts its share of amusing lines. But the latest book also kept me awake long past my bedtime, which was good because, at 909 pages, it took me a while to get through it. Ironically, such a long book requires a great deal of telling. The cliche in writing is “show, don’t tell,” but in a series with hundreds of characters, a map full of countries and armies, and countless scheming factions within factions, showing everything would take a thousand books. Even the most dedicated reader would give up out of boredom. As it is, the novel’s compression of certain facts—the way it tells the reader what is happening—actually heightens the tension. “If there was human resistance anywhere in the city, it would be the Palace. Unfortunately, fists of Trollocs roved the area between Talmanes’ position and the Palace. They kept running across the monsters and getting drawn into fights. How does the writer condense a sprawling scene into two short paragraphs? The first sentence sets the stakes. Yes, there’s a battle involving tens of thousands, but it all boils down to a simple statement: If anyone is left to fight back, they’ll be in one particular place, the Palace. The next two sentences locate the Palace within the two sides of the battle, the main character’s men and the monsters. The next paragraph explains the consequences of the previous three sentences: the character’s men will have to fight their way to the Palace, which means likely being surrounded by monsters. The reader has been given something to look forward to: an all-or-nothing race to safety. Because the huge tapestry of a scene is boiled down so neatly, the writer is able to quickly move in subsequent paragraphs to the particular drama of Talmanes’ quest without constantly reminding the reader of what is going on around him. In other words, the novel gets the requisite info out of the way so that the story can begin. Choose a scene that you have already written. Read what remains on the page and answer this question: What does the reader need to know in order for this scene to move as quickly and effectively as possible? In other words, what would you need to tell the reader up front so that you could avoid slowing down the dialogue and action with detail. Make a list of everything the reader must know. Write a paragraph or two that will preface the scene. Use the paragraph to tell the readers what they need to know—to set the scene. Be concise. Keep in mind your list and focus every sentence on delivering necessary information. Now that the scene is set, you can return to the dialogue and action and add in any details necessary to heighten the mood or tension or to adjust the speed of the narrative. As you work with this exercise, you may find that telling the reader the right information up front makes the scene that follows easier to write. Rather depressingly, while doing this exercise I discovered my scene was already set up like this – as was the next one I looked at. So this was useful, as now I can look at my stories with a fresh eye and see if I need to remove some of this prefacing and just get on with the thing! Ah, that’s a good observation. That could mean that you’re trying to organize the scene in your head before you write. What would happen if, in some scenes, you cut the preface and tried to integrate the most important parts into the scene itself? Cool post! I think you’re dead-on in the analysis, especially in pointing out that clear articulation of the stakes is crucial to the building of tension within a scene. Too often I come across paragraphs (or entire chapters) where I end up wondering: Why does this matter? I just discovered this blog, and I’m looking forward to checking it out more fully. Looks like I’m doing a similar thing — looking at issues of craft in the writing of fantasy — over at bstaveley.wordpress.com. Feel free to come by! Just checked out your site–great discussion of craft. Though the commentary is focused on fantasy, it’s applicable to all forms and genres. I’ll be looking forward to your book next year.